Micro Ridge Stylus is the newest one that was born by the most advanced technology for video disc player systems. 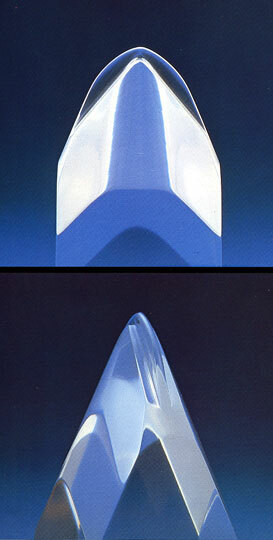 As shown in the photographs, Micro Ridge is very unique stylus which is polished into the unusual shape. It has microscopic curvature of contact surface with records. This makes Micro Ridge Stylus does not change the contact radius by the wear after long playing time.You can always listen to music by the new stylus. At the same time this curvature has the radius of only 2 microns. Due to this small figure, the reproduction sounds have very high definition, wide dynamic range and low distortion. Combinations with minimum dispersion theory, low equivalent moving mass and the very new stylus will show the new aspects in the reproduction sounds. Dynavector is sure that digital sounds will never be able to compete with such a sophisticated sound quality from analog discs when played by these advanced products like DV-KARAT.